I’ve been dreading today for YEARS – after six years on a career break, spending wonderful time with my little ones, I’m finally going back to work. That idea alone would have been hard enough to accept but I’m also facing a horribly long/expensive/busy commute which I’ve never done before – previously I lived an easy half hour to 40 minute tube ride away and after big S was born I only worked 2 days a week! The whole thing has been upsetting me for ages – I can’t bear the thought of trudging off in the dark to do a job I’m no longer sure about and missing so much family stuff…. I don’t suppose anyone wants to pay me to write my blog instead do they?? Anyway, to feed the girls when they get back from school tomorrow (while I’m still miles away ) I’ve made a rich and comforting double chocolate chip cake with fluffy white buttercream. I hope they like it 🙂 … and I hope I get home early enough to enjoy it with them. Hopefully a less emotional post from me next time! – In a separate bowl, mix together the oat milk, melted dairy-free spread, soya yogurt and vanilla. – Mix the wet ingredients into the dry. Mix gently until well combined. – Cool in the cake tin. That cake looks so good. I love the contrast between the chocolate cake and the white buttercream. And your decorations are adorable. I hope you had a good day working and a better day home. Thank you…it was much better to get home! 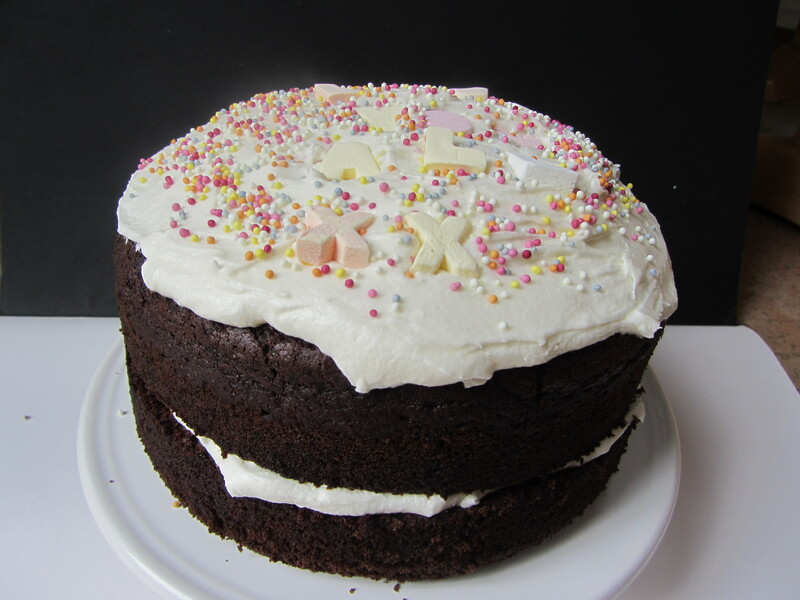 The cake did turn out rather black and white in the end! P.S. That cake looks and sounds amazing!! You are breaking my heart. I think when we are lucky enough to be able to stay at home with young children that when it’s time to go back to work that it will surely be emotional. I’m dreading it myself, but I’ve still got a couple years. I can’t wait to hear about this phase and how you like being back at work. Good luck with your return to work. It’s hard changing a routine one’s grown accustom to, I notice it when returning just from a vacation… Love the cake. What are the letters made out of, marshmallow? Did you make them yourself? So much cuter than piped, icing letters. You’re right, any change is hard. The letters are some kind of old fashioned candy sweet from a shop called ‘hope and greenwood’…. We didn’t have all the letters so it took a while to work out the phrase on top! Hi, I just wondered if you’d ever seen http://www.violets-vegan-comics.com it’s this really good company which makes comics for vegan children. I find it really inspiring and I would have really liked to have had comics like them when I was a vegan child. So maybe they’d be good for your little children? 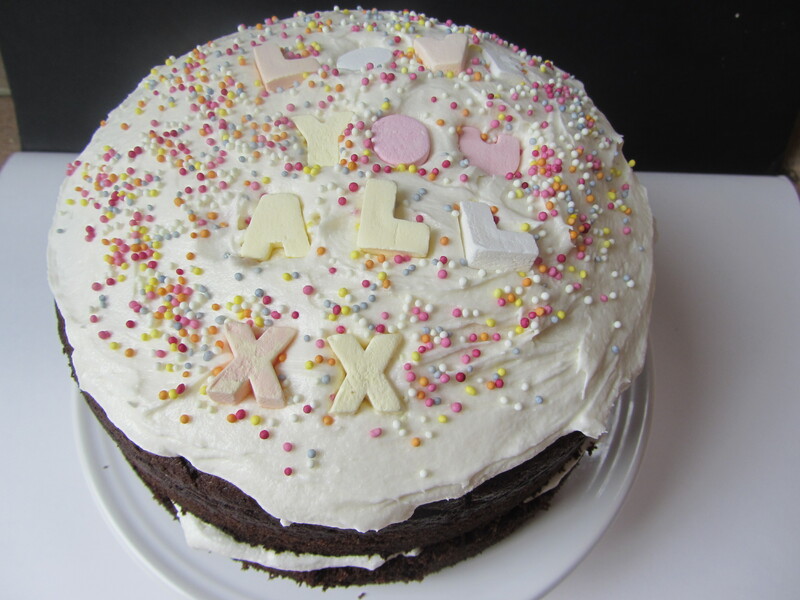 I love the look of your cake – I want to make one today! !